railing component system for Residential and Commercial. 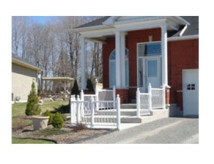 We have the railing to fit your needs, that exceeds the Ontario Building Code requirements. All our rail glass is 6 millimeter tempered with polished edges. A choice glass can be clear, or tinted bronze, grey, or green. Obscure glass (such as: pin head, acid etched, rain or Aquatex) can be used for privacy. We have three standard picket choices. Collars can be added to the square pickets for ornamental purposes. We offer custom options to simulate wrought iron. Standard post sizes are 1 ¾” square, 2 ¾” square, and 4” with fluted corners. Standard heights are 36” and 42”. Custom heights are available. Give us a call or preferably fax or E-mail us a sketch of your deck and stairs and let us help you with post layout and provide a quotation. For the do-it-yourselfer, we provide ALL materials assembled as much as is practical. Minimal labour is required as all pickets are preassembled into the precut rail. We also provide professional installation by our own staff.